We solve various problems regarding wastewater containing heavy metal compounds. The addition of “ND Metal Clear” immediately begins a chemical reaction with heavy metals dissolved in wastewater and insolubilizes them. Because this agent can undergo a chemical reaction with any kinds of heavy metals, it helps you simplify the process and save the cost. Besides, its powerful ability to remove heavy metals enables reuse of wastewater. 1.We would like to clean water to the level where heavy metal compounds are not detected. 2.We would like to treat various heavy metal compounds at one time. 3.We would like to clean water in a simple way and at as low cost as possible. 4.We would like to clean water to the level enough to reuse wastewater. We would like to clean water to the level where heavy metal compounds are not detected. 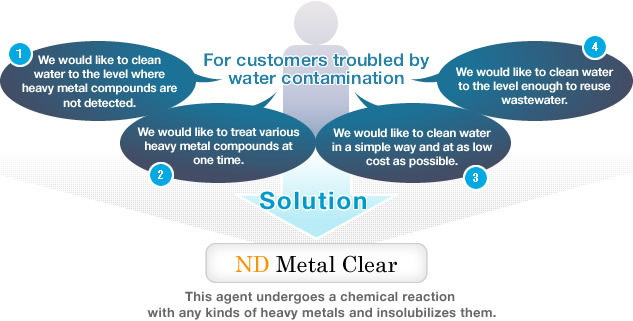 “ND Metal Clear” immediately undergoes a chemical reaction with heavy metal ions dissolved in wastewater and insolubilizes them even with a smaller amount compared to the conventional chelating agent. As it separates heavy metals as sulfides which do not dissolve into water, you can clean water to the level where heavy metal compounds are hardly detected. The reactant is stabilized. Besides, heavy metals will never dissolve into water again from sludge. We would like to treat various heavy metal compounds at one time. The conventional chelating agent enters into bond formation based on selective complex formation (valence of material) and forms insoluble metals complex. However, as its selectivity is not enough, it is necessary to prepare different chelating agents depending on condition of wastewater or contaminated material. “ND Metal Clear” can undergo a chemical reaction with any kinds of heavy metals, and then stabilize and insolubilize heavy metal ions. 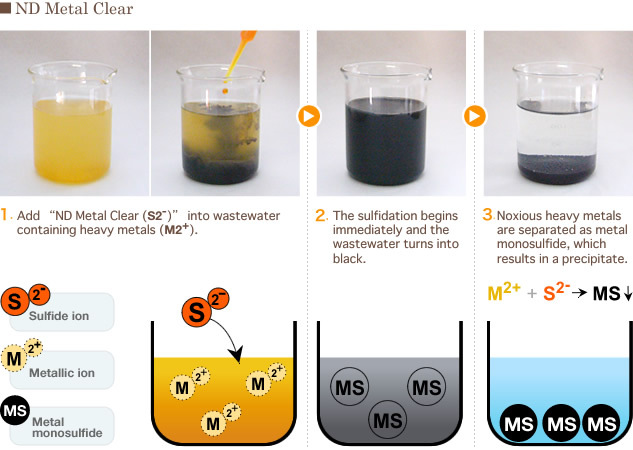 Thanks to such property, even a small amount of “ND Metal Clear” can separate various types of heavy metals as metal monosulfide with low solubility. We would like to clean water in a simple way and at as low cost as possible. As you can clean wastewater simply by adding this agent, there is no need to maintain pH balance strictly or prepare any particular machines. In other words, the agent enables you to simplify the process. As it surpasses conventional chelating agents in terms of the removal ability, even a small amount is enough to purify contaminated water to below the standard value. Besides, because “ND Metal Clear” supports various types of heavy metals, you don’t have to prepare different types of agents and can save the cost. In addition to that, the amount of generated sludge can be reduced, which helps you save the cost to discard the sludge. We would like to clean water to the level enough to reuse wastewater. As “ND Metal Clear” has powerful ability to remove heavy metals, the reuse of wastewater becomes possible. 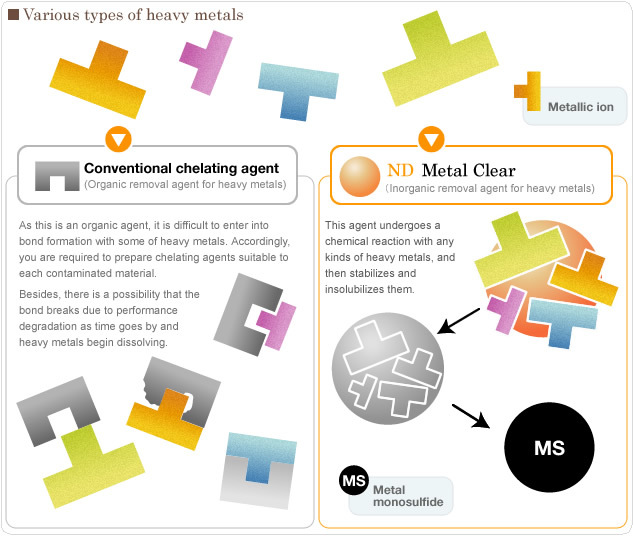 Thanks to its extremely high reactivity with heavy metals, “ND Metal Clear” can undergo a chemical reaction with heavy metals dissolved in wastewater and separate them as metal monosulfide with low solubility. As no heavy metal is contained in the wastewater after the chemical reaction, it can be reused as water for factories. Furthermore, if you use "ND Kiyo Metal" in combination, the tackiness of sludge can be greatly reduced compared to when a general high-polymer coagulant is used. You can also dehydrate sludge in a short time.